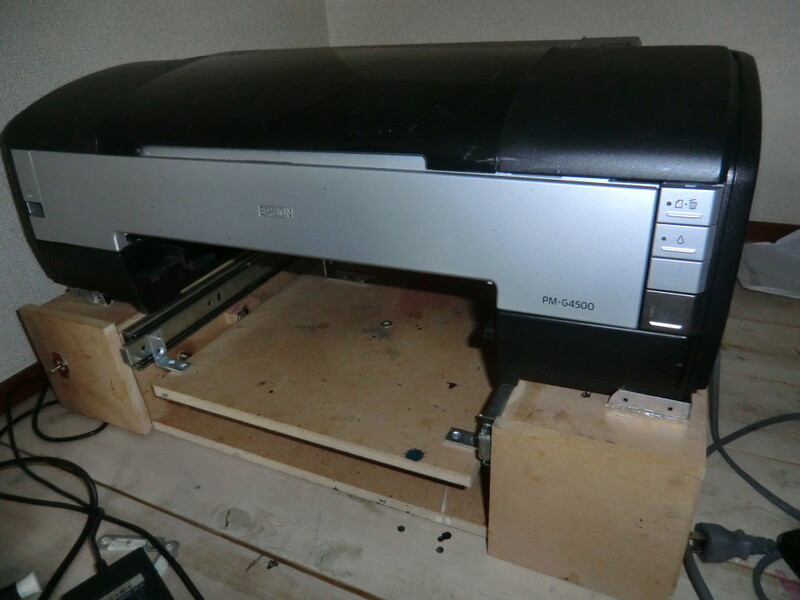 Hello, today I will be showing you the full details of my homemade dtg printer based on Epson PM-G4500 which is the same as Epson 1400 but this one is the Asian model. I decided to do it because I won’t be using this anymore and I plan on reusing some parts on my new upcoming projects. It’s required to have a medium bottle to store the ink that it’s not used, if you don’t do it things will get very nasty and dirty. This is the easiest part to solve. A lot of people have trouble with this sensor because it works different on A4 models. When the sensor is triggered (Nothing between the sensor or the lever is pushed) it acts as if there was paper inside it, and when the sensor is not triggered (wood or plastic between sensor) it acts if there’s no paper inside. Now when you send a print job to the printer, the sensor should be triggered off (wood or plastic between sensor) and it should be set in way that when the table moves 1.5cm after you send print job it activates the sensor (Nothing between the sensor), and goes activated for 42cm (The size of an A3 paper) after 42cm of movement the sensor should be turned off (Wood or plastic between sensor), so it acts as if the paper left the printer and print job is complete. If you don’t do it the printer will go crazy and start moving non-stop resulting in paper jam. Any doubts or question please use the comment box down below. Nothing special here. Just a very slim rubber tape to keep it tight and prevent unexpected movement. Having brackets in place makes things easier in case you need to take apart some stuff and be able to place it in the exact place. This is another sensor called ASF sensor, it has absolute no use in a DTG printer but it must be working normally in order to print. The main function of this sensor is to move the paper tray and feed paper inside the printer. Here we have the encoder sensor and lots of wires that connects to the DPTP switch, and allow me to switch off the power that goes from main board to the motor and turn on the external power supply to reverse the motor without risking any short circuit. There other kinds of ink but I highly recommend this one. It’s affordable and durable. Thanks for reading this post and don’t forget to come back soon for new posts!